It doesn’t take much stagnant water for mosquitos to find a place in which to colonize and reproduce. The new scientific measure of how much is enough is a mere bottle cap of water. It’s tough to spot this small amount of water and we hear all the time, “I have mosquitos but not stagnant water”. If you have a problem with mosquitoes don’t dismiss any amount of standing water or mud and be vigilant in monitoring drainage in your garden and lawns. · The saucers beneath your container plants. · Plant soil and basins where the water isn’t draining. · Improperly maintained or ‘empty’ pools. · Eaves, rain gutters and drains around the house. · The edges of a pond. Female adults find a blood meal and lay eggs on or near water. This includes soil areas that are wet. Her eggs can survive dry for months. Eggs hatch when exposed to water. 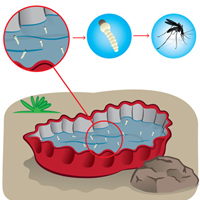 Hatching speed depends upon the water temperature and type of mosquito. Larvae live in the water, molt several times and need to surface for air now and again. Pupae do not feed. Adults emerge from this stage after about 2 days to 1 week. The adult emerges. The females can live over a month and they require a blood meal to reproduce. Think of all those babies. I’m not sure what their proper place is on the planet but, at their best, mosquitos are an annoyance and at worst they are a health hazard. So, how do we control them organically? Options are varied and inexpensive – but one use may not be enough, so be prepared for repeating the process. For any areas that are very moist to wet, consider applications of granular Bti, Bacillus thurengiensis israelensis. This bacillus has been used for more than 40 years and there is great confidence in the scientific community that mosquitoes will not develop resistance to Bti. Bit only affects the larval stage of certain Dipterans – which include pests such as mosquitoes, fungus gnats, and black flies . The Bti works because of the pH of the mosquitoes' intestines. In other good news, Bti cannot survive in the intestines of mammals, birds, or aquatic life. So, it is entirely safe to use when dogs (and other animals) are present. Bti is available in granules and dunks. For larger areas or if you anticipate repeat applications, try the larger sizes of granular Btipackaged as Aquabac. If you prefer liquid applications, try Aquabac Xt. Bonus on Aquabac products – they ship for free within the contiguous 48 states! All of the Bti products are safe to use around humans and other mammals, reptiles, amphibians and birds. They can easily be used in stock tanks and other drinking reservoirs for your animals – just beware they may eat them. While it won’t harm them, the dunks and granules don’t control mosquitoes once consumed by other animals. If you need a fast solution for your bar-b-que or outdoor shindig, try spraying the breeding areas and any area of the garden where mosquitoes are swarming with Mosquito Barrier or Garlic Barrier - a garlic based liquid that smothers adult and larval stages of the mosquito rapidly. The smell of garlic dissipates quickly but continues to repel mosquitoes for some time. A bonus with Mosquito Barrier or Garlic Barrier is that they also repel ticks, gnats and fleas AND you don’t need to know exactly where the bugs are in order to gain control! If the thought of spraying a garlic solution in the garden or on the lawn is too much for you, try Mosquito Magician. Mosquito Magician is a botanical concentrate that acts as a smotherant for the larvae and a contact kill for the adults. It repels for up to 2 weeks. The botanical combination includes: citronella, cedar, lemongrass, garlic, geraniol and rosemary oils. There is a new bacillus in town that is selective to killing mosquitoes only. Bacillus sphaericus, Serotype H5a5b, strain 2362 is highly selective and kills only mosquitoes. Packaged under the trade name, Spheratax SPH, it is a water soluble powder that is safe to use by or in contact with mammals – humans, dogs, cats, horses, livestock, wildlife – as well as around birds, reptiles, and amphibians. 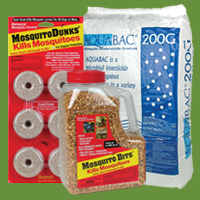 If you are interested in learning about more organic and natural ways to control and repel mosquitoes, follow this link to a comprehensive list of the products we offer: Mosquito Control. If you have questions, please feel free to contact Dr. Buglady– she’s happy to answer any questions you might have!